Islamic State militants have entered Syria’s historic city of Palmyra, a UNESCO landmark, after gaining full control over the city, a monitoring group said Thursday. 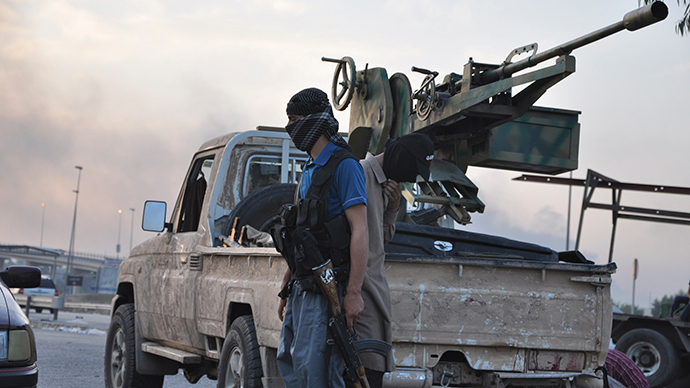 The extremists now control more than 50 percent of Syrian territory, it adds. The Syrian Observatory for Human Rights told AFP that overnight IS seized most of the city, including an army intelligence outpost, a military airport and a prison. "IS fighters are in all parts of Tadmur [Arabic name for Palmyra], including near the archaeological site," Observatory head Rami Abdel Rahman said. The militants confirmed on Twitter that they gained full control over the ancient city, Reuters reported. The Syrian Observatory for Human Rights said Thursday that 17 people, including members of the Syrian security forces in Palmyra, have been executed by IS, some of whom were beheaded. In total, 49 people in and around the city have been killed by Islamic State, the monitoring group said. The UN human rights office also announced Thursday that a third of Palmyra’s population of 200,000 have fled the town, although there have also been reports of government forces preventing civilians from leaving until they had abandoned the town themselves. The remains of Palmyra, once one of the world's key cultural hubs, stand in the middle of the desolate Tadmorean Desert in Syria. The monitoring group says that this is the first time the jihadists have taken a large population center directly from Syrian pro-government forces. The group is already controlling wide areas in Syria's north and east. Many fear that after falling into jihadists' hands, Palmyra would suffer a fate of the ancient Assyrian city of Nimrud, Iraq, which they devastated earlier this year. Syrian state TV said pro-government fighters had withdrawn from the city. On Wednesday hundreds of statues were moved from the city to locations safe from IS militants, Syria's Director of Antiquities Maamoun Abdulkarim told Reuters. "Hundreds and hundreds of statues we were worried would be smashed and sold are all now in safe places," Abdulkarim said. "The fear is for the museum and the large monuments that cannot be moved," Abdulkarim added. "This is the entire world's battle." Also on Wednesday the pro-government National Defense Forces (NDF) evacuated civilians from the area, state TV reported. UNESCO describes Palmyra as a city of "outstanding universal value," an "oasis in the Syrian desert" northeast of Damascus. "From the 1st to the 2nd century, the art and architecture of Palmyra, standing at the crossroads of several civilizations, married Greco-Roman techniques with local traditions and Persian influences." "The terrorist attack [by IS] on Palmyra is to take revenge on Syrian society and civilization," Syria's antiquities chief told Syrian Arab News Agency (SANA). Abdulkarim earlier said that "If IS enters Palmyra, it will spell its destruction," and if the ancient city falls, "it will be an international catastrophe." "It will be a repetition of the barbarism and savagery which we saw in Nimrud, Hatra and Mosul," he added. The extremists also destroyed a museum in Iraqi city of Mosul, which they captured in June. The group posted video online showing militants destroying ancient statues and other artifacts, saying they are symbols of idolatry. Some of the objects date from the 7th century BC. In February, the jihadists blew up the Mosul Public Library using homemade bombs. The previous month, the militants took all the books from the Central Library of Mosul, leaving only Islamic texts.